Next to their mortgage, the majority of Dutch people need a loan to fully finance their first home. 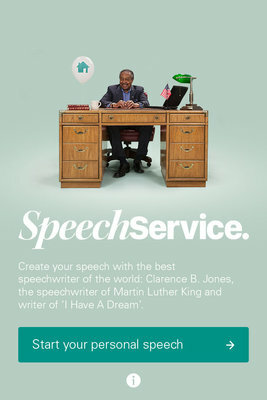 Clarence B. Jones, speechwriter for Martin Luther King and co-writer of the famous ‘I Have A Dream’ speech, helps them succeed by writing the perfect pitch. Banks in the Netherlands can no longer give full mortgage support to people buying their first house. And a ‘Mom, dad can I borrow 20 grand? '-conversation isn’t a comfortable chit-chat for most youngsters. That’s why ABN AMRO bank decided to help. By giving them their own world-leader worthy speech to convince their parents. 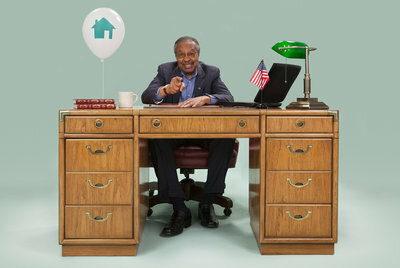 Written by the co-writer of ‘I Have A Dream’: living legend Clarence B. Jones. Dr. Jones will walk you through the process. When you're done you can share your pitch in many relevant ways. But if you really want to make an impression; be sure to practice your presidential skills using the build-in autocue. 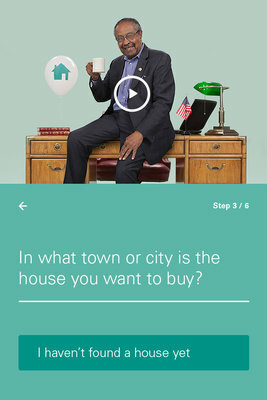 This speech might bring your dream house a step closer.